On Monday, the Big Brother Live Feeds went down for a special backyard event for the houseguests. Through watching the feeds, we were able to learn that the houseguests attended a backyard county fair and concert. 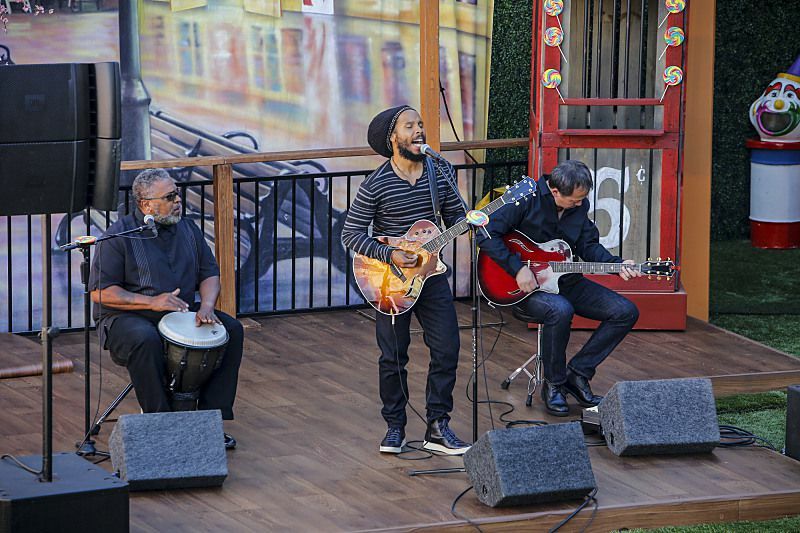 The concert featured singer Ziggy Marley, Bob Marley's son. Also the houseguests got to enjoy food (even the have-nots) and games with prizes during the event. It was speculated this was just a luxury comp for the houseguests, or a fun event for reaching the final eight. However, it was confirmed today by CBS that this backyard event would be Friday's episode. The press release said, "BIG BROTHER is throwing the ultimate summer bash with a county fair themed special episode, Friday, August 19 (8:00-9:00 PM, ET/PT) on the CBS Television Network. Houseguests will have the opportunity to compete for prizes, perks and power, and seven-time Grammy-winning reggae artist Ziggy Marley stops by to surprise the houseguests with a performance of his single “Weekend’s Long,” from his new self-titled sixth studio album." In addition, Mr. Pec-Tacular himself announced that he would also be making an appearance at the "BB County Fair". I have a hard time seeing how they're going to fill an entire house with just this county fair, but this appears to be the main reason for Friday's episode. It is speculated that this was meant to be a jury buyback competition show and that Paulie must have the round-trip ticket to return, so they needed something to fill the episode. Obviously we can't confirm this until Thursday night, but it's definitely an interesting theory. In addition, if Paulie does get evicted, and doesn't have the round-trip ticket it will be interesting for them to have an out of sequence episode and have to explain that it was taped before his eviction. Are you at all interested in Friday's episode? Let us know your thoughts in the comments below!